SOLD!!! Congrats to Jenny Johnson and her son!! Medium pony. Perfect for walk/trot- pony hunters. 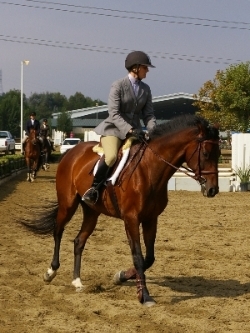 14'1 Connemara pony, 13 yr old bay gelding. Very kind and sweet. Lovely to flat, extremely smooth gaits, excellent lead changes. Very brave to the jump can easily do x-rails to 3'. Can be a pony of all trades......jumpers, hunters, dressage, or even eventing. A very useful little guy and easy to fall in love with!! Paso is a very handsome and special guy! He has belonged to a trainer the last 5 years. 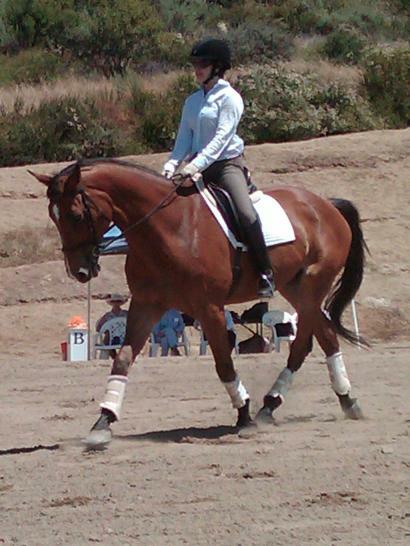 He is incredibly fun to ride and has lovely smooth gaits. He has had extensive training, most recently in dressage. He is EXCELLENT on trail and goes happily anywhere including many times the beach. He is very safe and reliable.....has no spook and can sit for days and still be quiet and pleasant to ride. Can be used for a very advanced rider in dressage or jumping....but has also been used in beginner lessons or can take husbands out on a trail ride. VERY sound in body and mind. A good home is a MUST!!!! 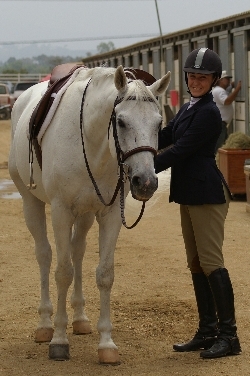 Congrats to Keri Homer of Rising Phoenix Equestrian Center! Swiss is a 16'1 Thoroughbred gelding that is 6 years old. Swiss is a horse with unlimited potential. 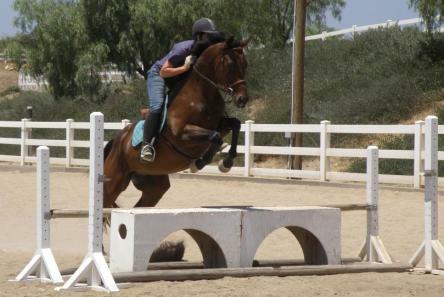 He can excel in the Hunter Ring, Dressage Ring or in Eventing. Beautiful mover, great work ethic and a lovely quite disposition. He is a wonderful horse who is a joy to be around. Has a great rhythm and balance to his canter. SOLD!!! Congrats to Louann and Lisa! "Chica" is a beautiful 6 year old chestnut mare. She is very sweet and loves attention! She is a very quiet and sensible mare and has a great work ethic. 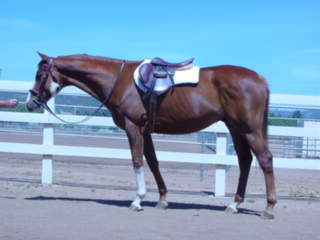 She is very balanced under saddle and soft in the bridle. 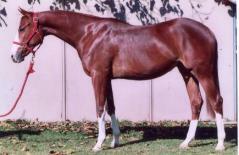 She has had excellent training under saddle in both western and english. She has a couple years of training over fences and is willing to jump anything you put in front of her. She has shown a couple times in the baby greens at 2'6 and placed very well. 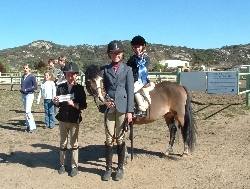 She recently went to a show with 12 year old rider and took home a first in the green rider division out of 15 riders. She has nice clean lead changes. She has excellent breeding and is registered with the APHA. Already absolutely kid safe. This mare is fun and enjoyable to work with! Currently in full professional training. Price will increase with training and showing. Offers considered. May also be available for lease to the right person. SOLD!!! 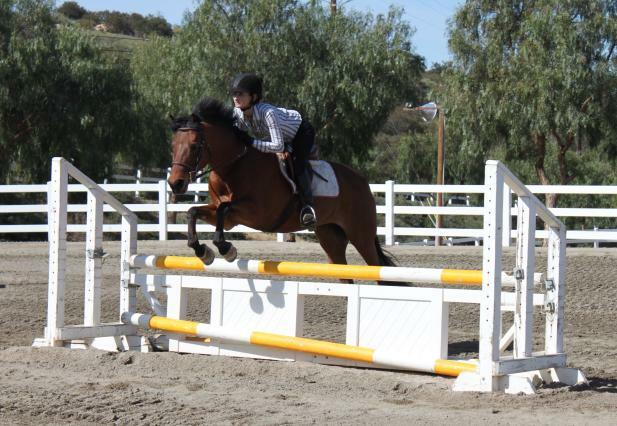 Congratulations to Natalie Goodwin of High Flying Farms in Santa Barbara and Brooke! "Justin" can teach you how to jump and win in cross rails and take you all the way to 3' and win in the very advanced Flat Medal class. Justin is an absolute joy to work with at home and at the shows. A trainer's dream horse....no prep required! He can take care and pack around anyone in the smaller classes, but then be advanced and technical in the higher classes. VERY SADLY OUTGROWN! 2008 Foxcroft Medal Finals Champion. 2008 - Winner of the Mini Medal Finals at the Championship show!!! Serious Inquiries Please and a good home a MUST! Conratulations to Kendra Kutina on the purchase of Joey! We are so excited that this great horse gets to stay in the Elite Show Stables family! "Joey" is a very handsome 8 yr old TB succesfully shown on the GSDHJA circuit in all three rings. Very scopy, huge stride, lead changes, and excellent ground manners. Easily jumps 3'-3'3". Currently showing in Adult Amateurs and Children's Hunters. Very typey hunter with a puppy dog personality on the ground and even great on trail. update: Joey was Reserve Champion at the GSDHJA Championship show by scoring an 83.5 in the Long Stirrup Eq O/F......he really seems to enjoy being a packer as well!! "Patch" is a five year old double registered TB/Paint. He stands at about 16'1 and takes up your leg nicely. He has never raced and has a light year of training under saddle. 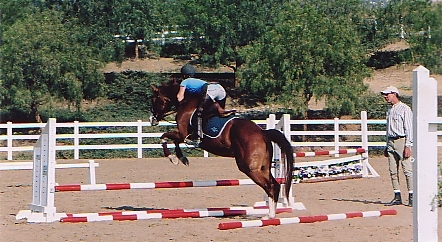 He is now in professional training and is starting over cross rails and small jumps. He seems to learn quickly and should come along very quickly. He has SUPER AUTO LEAD CHANGES that are smooth as glass. He has great rythem to his gaits and they are very comfortable to ride. He ties, clips, loads, and hauls. More info and pictures to come as he gets into training. Priced for quick sale. Helicon Poetess is a 1996 grey medium Section B Welsh (GlanNant Epic X GlanNant Aria by *Cusop Sheriff) Very fancy, an exquisite mover! Good jumper, fluid lead changes. 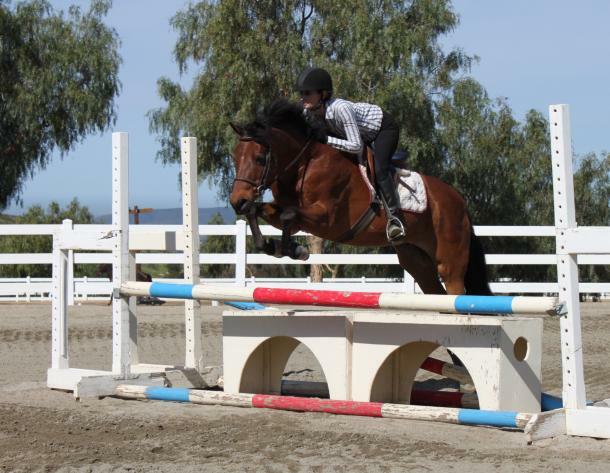 Poetess can take a rider from short stirrup to medium pony hunter as she is very kind with smaller children. She is eligible green. In 2003 she was again Eng Pleasure Champion as well as Short Stirrup Champion at the Mts and Plains Welsh Show, leading USAE Zone 8 points Children's Pony Hunter, Year End Champoin in CHJA Short Stirrup and Equitation divisions. Past North Central Regional Champion Section B Filly and 4rth in the nation. Absolutely beautiful pedigree with Farnley Lustre, double *Coed Coch Prydyddes, Criban Victor, *Bowdler Brightlight, *Coed Coch Seren. SOLD!!!! Congratulations to Sandra Anderson. Prince is a great 1st pony. He stands at about 11'3, 7 yrs old, and has excellent ground manners. He absolutely loves being brushed and loved on by small kids and will stand quiet for hours. He is extremely kind and gentle on the ground and very fun to ride. He has very smooth gaits. His canter is very slow and comfortable, perfect to teach kids how to canter on. He will jump around and is safe and honest to the fence. He trailers and is wonderful to clip. He recently went to his first horseshow and was a perfect gentleman. Wonferful on the trail as well. Currently in professional training. This sweet pony will make some lucky kid a perfect 1st pony! To view more outstanding horses and ponies that are offered for sale, please visit Helicon Show Stables. Tiffany Sherbondy works very closely with Molly Rinedollar, located in Colorado at Helicon Show Stables. 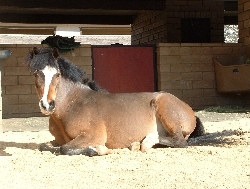 Molly has a large number of very high quality ponies and horses for sale and in the show rings. Please visit her website for more info.